In Part 1, we covered verbal sound effects. Verbs are not something you can escape when reading Japanese manga. You must gain a good feel for them if you are to avoid getting lost. 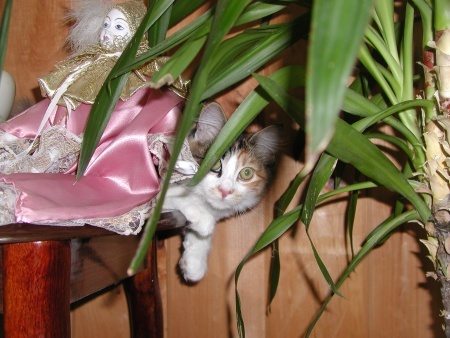 Let’s use a simple example using my stepmother’s precious little cat, Chiquitita, displayed above. (As the name implies, that’s my stepmother’s “little girl.”) Besides native Japanese verbs that have conjugations of their own, adding する (suru) as a suffix at the end of another word turns that word into a verb. So, in case kids at home are wondering… yes, I just turned a Japanese verbal sound effect into a verb. You can do that in Japanese. Here, we use it as a suffix that turns “bari bari” into a verb. バリバリします (bari bari shimasu) is the “polite form” of the verb, and makes Chiquitita’s scratching up the old chair sound more dignified. バリバリした (bari bari shita) is the “plain past” form of the verb. So, Chiquitita scratched up the chair, in the past tense. バリバリしました (bari bari shimashita) is the “polite past” form of the verb, making the fact the chair was scratched up sound more dignified. Let’s take a closer look at the padding, shall we? は = Always pronounced “wa” when used as a particle. を = Always pronounced “o” when used as a particle. In particles, wa is a topic indicator. For its part, o is a direct object indicator. Thus: Cat (<- topic) chair (<-direct object) rip, rip (verb, past tense). Cat wa chair o bari bari shimashita. The cat (topic) scratched up (verb) the chair (direct object of “scratched up”). Without being able to understand this simple sentence structure, knowing what “cat” and “chair” mean as individual words will still leave you confused about what relationship the words have to each other. Knowing sentence structure is important even when reading manga “for little kids.” It is something every reader should make an effort to absorb. Article first published as How To Read Manga Better, Part 2 on Technorati.